In the ramp-up to Wishbone’s 50th anniversary, the band is celebrating its 49th year in characteristic fashion: with an extended tour. Dubbed XLIX (49 in Roman numerals), the tour began in October 2018 in the UK, followed by dates in Europe and, in Spring 2019, comes to North America. 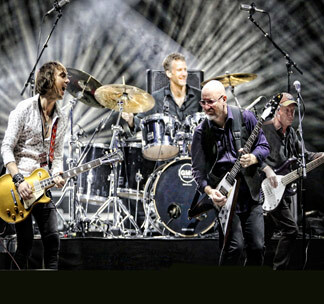 Longtime fans and new converts alike will revel in the group’s signature twin-guitar mastery and powerhouse rhythm section as they present classics spanning their career. Mark Abrahams, the group's newest member, has been trading licks with Andy Powell for two years. Right out of the gate, Abrahams earned rave reviews from critics and fans on both sides of the Atlantic. Longtime rhythm section Bob Skeat on bass and Joe Crabtree on drums continue to provide the solid groove that is their hallmark. Power and melody have made the Ash a hard act to follow, while they are currently being discovered by new generations of loyal rock fans. Through the years they have delved into various musical genres, from blues, folk and jazz to pedal-to-the-metal rock and electronica. Whatever the style, Wishbone’s signature is the distinctive twin-melodic lead guitar interplay that has influenced such bands as Thin Lizzy, Lynyrd Skynyrd, Iron Maiden and, more recently, Opeth.